Bei Bugaboo Stamps ist noch bis Monatsende alles 50% reduziert im Angebot… und ich habe mich dort etwas umgeschaut und das Pinguinmotiv dieser Karte gefunden. Bugaboo Stamps offers 50% off the entire store until the end of the month so I had a look for more digis. Among a few others, I also chose the penguin motive of this card. Und wie sich herausstellt, erfüllt die Karte die Voraussetzungen für gleich vier Challenges: Merry Monday möchte Herzen auf der Karte sehen (könnt ihr’s finden?! ), Holly Jolly ist inspiriert von Weihnachtsliedern (bin ich das nicht immer? In diesem Fall: Joy to the World), bei CCAYR möchten sie Streifen und Punkte sehen (ich hoffe, ein Streifen reicht) und bei Sparkles Christmas Challenges geht es um Schleifenband, Spitze oder Kordel (hier fand silbernes Schleifenband Verwendung). As luck would have it, the card qualifies for a total of four challenges: Merry Monday would like to see a heart included (can you find it ?! ), Holly Jolly want us to be inspired by a Christmas carol (aren’t I always? In this case: Joy to the World), CCAYR is all about dots and stripes (I hope one stripe is sufficient to qualify) and then there’s Sparkles Christmas Challenges who would like to see ribbon, lace or twine included (there’s silver ribbon put to use here). Such a happy little guy. I love all the sparkle! it took me a bit, but i found the heart on that cute little penguin’s tummy – fun card! I found that little heart, Barbara! 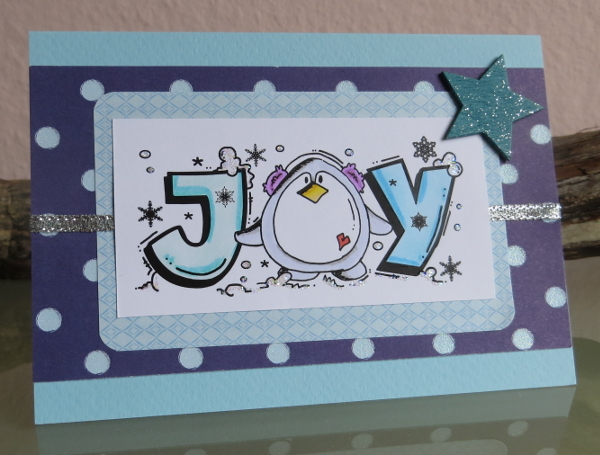 Love the cool blue colors and the delightful penguin! Thanks for sharing with us at Merry Monday! I absolutely love this card right down to the glitter! Trust Bugaboo to come through! Darling Joy penguin and I love the little heart on his tummy! Love the image. Thank you so much for sharing with us at Sparkles Christmas Challenges. Fabulous,fun card-I love how the Penguin makes the letter-fabulous! This is so cute and so beautifully colored! Wonderful Christmas card. Thanks so much for joining us at Merry Monday. What an adorable card. Love the colors. Thanks for joining our challenge at Holly Jolly.